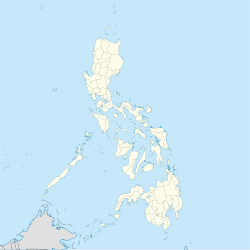 Can-avid, (IPA: [ˌkɐnˈʔavɪd]), officially the Municipality of Can-avid, is a 4th class municipality in the province of Eastern Samar, Philippines. According to the 2015 census, it has a population of 21,015 people. Can-avid was created in 1948 from the barrios of Can-avid, Carolina, Barok, Cansangaya, Mabuhay, Camantang, Canilay, Pandol and Balagon, formerly part of Dolores, Eastern Samar, by virtue of Republic Act No. 264. In the 2015 census, the population of Can-avid, Eastern Samar, was 21,015 people, with a density of 73 inhabitants per square kilometre or 190 inhabitants per square mile. ^ "An act to create the municipality of Can-avid in the province of Samar". LawPH.com. Retrieved 2011-04-08. ^ "Can-avid, Eastern Samar : Average Temperatures and Rainfall". Meteoblue. Retrieved 30 December 2018. This page was last edited on 24 February 2019, at 09:04 (UTC).